Displaying labor law posters and updating the labor law posters when an update occurs are two requirements that all businesses must comply with. The simple solution that combines both compliance requirements is the Compliance Protection Plan™. 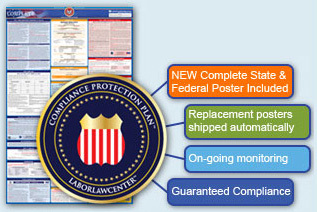 With one purchase, you receive the most up-to-date Complete State & Federal labor law poster AND a replacement poster program that will replace your labor law poster when a mandatory update occurs. This program provides your company with our 100% Unlimited Compliance Guarantee, hands-off administration, real-time updates, personalized service and more. The Compliance Protection Plan™ is the leading compliance solution for businesses in any industry. NEW Complete State & Federal Posters that include the most current labor law postings shipped to each location. Continuous monitoring of your account for mandatory revisions from our Compliance Experts. When a mandatory update is detected, new Complete State & Federal Posters are shipped directly to each location at no additional cost. Best of all, you are 100% protected with our Unlimited Compliance Guarantee. If a location properly displays the latest poster delivered from LaborLawCenter™ and receives a government citation for improper posting content, we will reimburse ALL paid government posting fines—no matter the cost. You must submit a request for reimbursement and show documentation of the paid fine within 10 business days of paying the fine. Terms and Conditions apply. With over 13 years of commitment to the compliance industry and never receiving a poster violation, you can trust LaborLawCenter™ to manage your company’s compliance. Education on labor law compliance and answers to your commonly asked questions. Find out about the update shipments from previous quarters and any upcoming shipments. When will I receive a new poster? With your enrollment, an up-to-date Complete State & Federal Poster is shipped right away. Whenever a mandatory update occurs, we ship a new Complete State & Federal Poster then at no additional cost to you. How do I receive my updated poster? Second: Ship the updated Complete State & Federal Poster via UPS and the tracking number is emailed directly to you. The poster usually arrives within 3-5 business days. Third: When your new poster arrives, discard the older one and display the new one to remain compliant. Your account is automatically renewed at the end of your term to ensure continuous compliance. Renewal notices are emailed one month in advance with the option to cancel. If we do not receive a response to cancel, your account will be renewed using the initial payment method.